Welcome to the Kentucky Pages, a web page devoted to lifestyles in the Bluegrass state. Relax, sit back with a glass of iced tea (or your favorite beverage) and browse our pages. We hope you will come visit us again as we continue to add new material. We want to make these pages an opportunity to share information which you might find useful - about the Bluegrass State, its customs, its people and its history. And we hope that it might be helpful in planning a weekend of fun with friends and family. A good place to start in looking at Kentucky is with the official Commonwealth of Kentucky web page. Just click below. A Note to Visitors: Operation on this web site was recently renewed, and I am trying to fix any broken links to other sites. I apologize for any inconvenience they may have caused. You may report broken links to kypacer - @aol.com - and I thank you for your assistance in keeping this site current. Fall in Kentucky is a beautiful time of year. Many communities, small and large, have local festivals with music, food, arts and crafts and special local attractions. We hope to report to you on some of these upcoming events. Have you heard about the new arts and crafts center in Berea? It is going to be a wonderful place to take your family and visit. 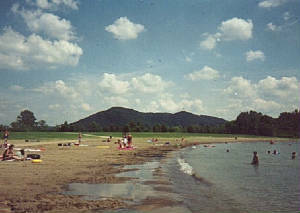 This is a picture of lovely Cave Run Lake in the middle of summer. It is a favorite place for boaters, campers, fishermen and hikers. This photo was taken by Kay Schafer, one of many local artists and photographers. 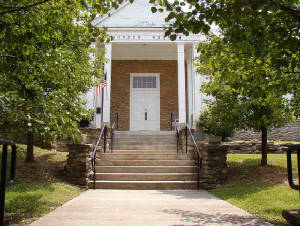 The Morehead Art Guild Show which is held annually in the area is one of the largest in the eastern Kentucky region, with entries in two-dimensional fine art, sculpture, folk art and photography. There is also a Cave Run Arts Association quite active in the area, and visitors to the area enjoy visiting the Folk Art Museum with its constantly changing exhibits. Plans for the Rowan County area also include a traditional music center to be built on First Street. Another exciting project which will take place in the next few years is the restoration of the old Rowan County Courthouse which is to become a center for the arts. Eventually a variety of artwork will adorn the walls of the completed center, and dramatic and other presentations will take place on the second floor stage.